As a humble columnist, I am puzzled. I have been writing on Israeli realities for a decade, and I find writing ever more difficult: nothing changes. How often can you write something different about the same things? The international media, on the other hand, has had no difficulty filling pages and screens, making the very same look quite different every time. These days, however, when Israel is really changing as it hasn’t done for decades, the international media keeps silent. The Israeli winds of change get some attention in the Guardian, for example, but little elsewhere. Can someone explain this paradox? What do they want? The protesters do not want peace. 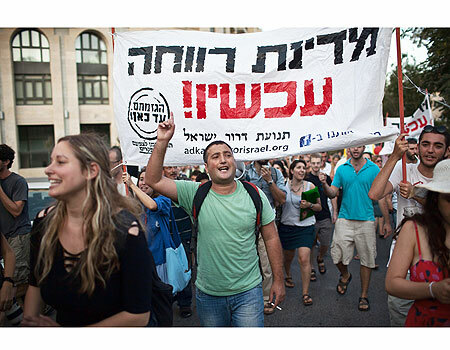 In fact, one of the common posters in Rothschild imitates the very font, color, and design of “Peace Now” and replaces it with “Welfare State Now.” This is what makes Israelis take to the street: the exorbitant cost of living in Israel. With average wages considerably lower than in Europe or North America, prices in Israel are often much higher. Obviously, life in Israel is economically much better than in neighboring countries. Why do Israelis expect more? Why do they compare themselves to Europe and North America, not to Egypt or Turkey? Because that’s what the Israeli state (all Israeli governments from the mid-1980s on have had precisely the same policy) has persuaded us to do. The Israeli ruling right wing (call it Labor, Likud, or Kadima; they’re all the same) has persuaded Israel’s middle class that peace is unnecessary: we can both run the occupation and have a Western standard of living. As evidence, they point at Israel’s membership in the OECD, the exclusive club of the world’s richest economies, or at Israel’s prosperous high-tech industry. But to keep this lie alive, they have to deliver. And the Israeli governments cannot deliver. The middle class hears the promises of the good life and reads reports on diminishing unemployment rates and strong growth, but it sees a different reality: it gets poorer all the time. I see it all around me: hard-working parents cannot raise their children — let alone buy a flat — without massive aid from their own parents. “Grandparents are not an ATM,” as some protesters write on their posters. The rage of the protesters is not aimed especially at the occupation. Some of the protesters are blind to the occupation’s economic significance; some of them fear a split in the protest if this becomes the focus. Indeed, the occupation is in my eyes Israel’s greatest sin, but not its only one. The protesters implicitly target the unfulfilled promises of the good life. They target regressive taxation, and they target the few Israeli tycoons who, because of the interdependence between politics and big money, have monopolized almost every branch of the small, isolated Israeli economy and turned the entire people into their captive market. Remember, however, that Assad tried to warm the border with Israel to save his skin. Netanyahu and Barak might do the same. Rumors in Rothschild Boulevard have it of a war in September (following a declaration of a Palestinian State?) to distract from the internal protest. If that happens, the big question will be: Will the young generation trade its colorful protest tents for khaki ones?